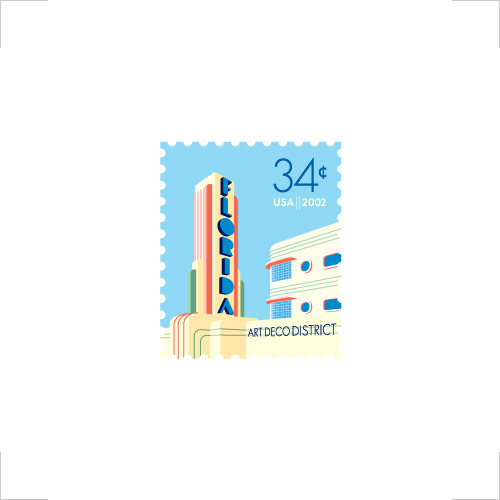 The first project was quite familiar: Design a postage stamp to celebrate something about one of the United States. I was assigned Florida. I’ve never been to Florida. Of course, I know a thing or two about it, but I wasn’t satisfied with just my anecdotal perceptions; I read books on the state and tangential topics to ensure total confidence in whatever direction I chose to pursue. Can’t you just hear the big block V-8 revs roaring through the state? 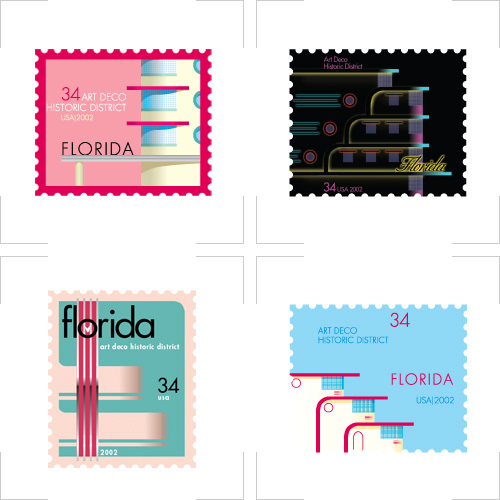 These studies allowed me to delve into some of the different iconic elements of the period: streamlined façades, bright pastels, rounded corners, chrome runners, large clocks, glass block, heavy eyebrows, neon back-lighting, stepped levels. 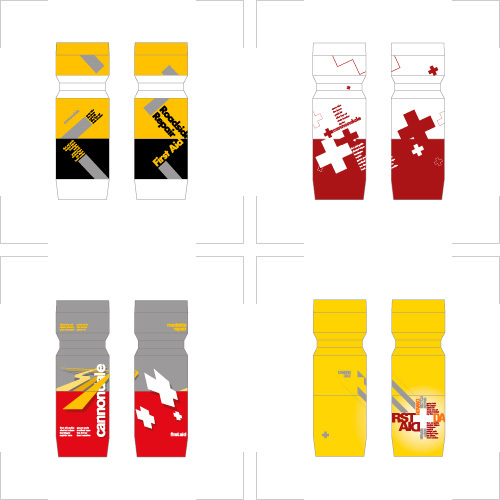 The second project was to create a package for a first aid kit. There are thousands of different kinds of first aid kits in the world. I did not want to just make one more. I knew a lot about bike riding by this point, having worked at a shop for four years and having ridden endless miles with hundreds of different people for fun and/or training, and I knew well the two worst things that could happen on a ride: a “mechanical” (something bad happens to your bike), or a crash (something bad happens to you). 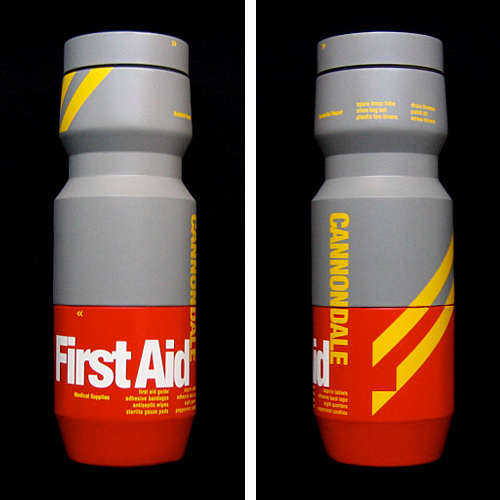 So, I designed a first aid kit for bike rides, comprising a roadside repair kit for your bike and an injury kit for you, taking the shape of a bifurcated water bottle that would fit in any standard water bottle cage on almost any kind of bike. But before I could apply any kind of graphics to the package, I had to actually make the package. I ordered about a dozen bottles that I figured would serve as the best platform for my mockup. I cut them apart and glued different pieces together to make two halves that would screw into each other. I chopped the cap to get rid of the nozzle and made a flat top from sheet vinyl. I filled beveled insets with putty and sanded off any external textural elements for a good base. I then glued ultra-thin sheet vinyl around the forms for a perfectly smooth exterior. 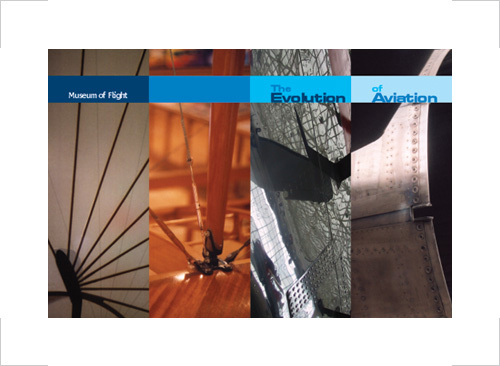 I was terrified that this thing would come flying apart before I could even submit it for class, but I must have done something right because I still have this eight years on and it’s still perfectly intact. 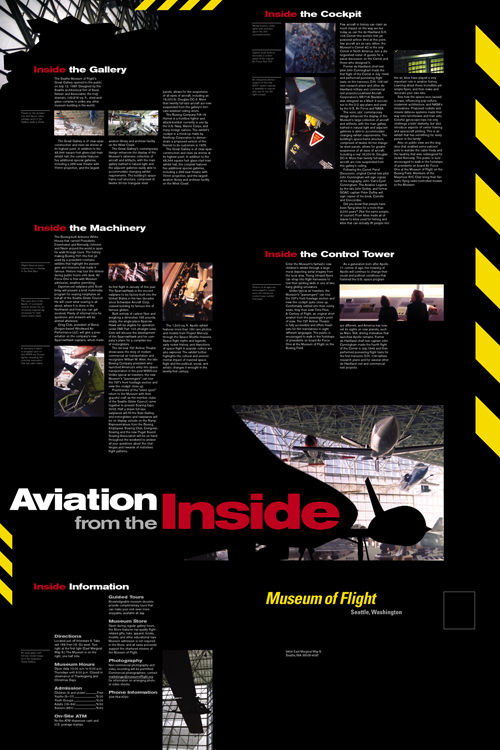 The final project was a poster-mailer for Seattle’s Museum of Flight. After some initial research, I packed the family heirloom WWII-era Leica and journeyed down to the museum with two concepts already in mind for this informative self-mailer/poster. 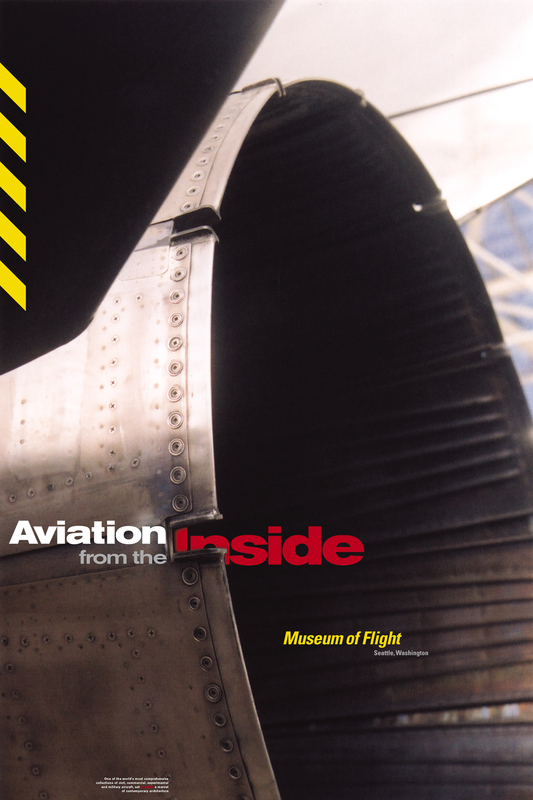 I think the idea is valid and compelling (if the initial design concept rather clunky), but it didn’t capture the essential attraction of the Seattle Museum of Flight. 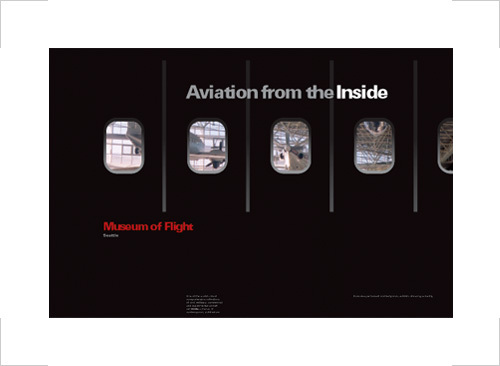 The first idea offered a view from inside the American Airlines 737 section one can enter from the second floor, which serves as a theater for films, and a window seat to the Gallery where real jets hang like rubber-band-prop toys from the ceiling. I was quite pleased with this photograph, and was so satisfied to let it be the hero of composition, bled full and even stealing part of the title. Caution stripes that complement the Museum type complete the tantalization. This remains one of my all-time favorite design projects. 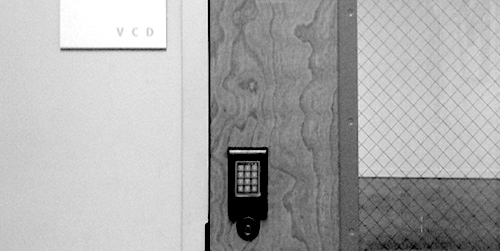 As the quarter’s end drew near, I had a distinctly new feeling. After three years of absence, I was again engaged. I was interested to see what I could do next. Though I would never admit it to myself, I was certain that I would not only make it into the VCD major, but that I could more than make up for lost time. So did the faculty. I was finally in.